A photo booth at your event can do wonders to keep attendees happy and positively influence the reach of your event on social media. Humans are naturally curious and will be interested to check out the photo booth and take some selfies. They might even start talking to other people at the booth, which will cause a livelier atmosphere. At the same time, we all love sharing selfies; and the same goes for pics from a photo booth. Here’s everything you need to get started with an event photo booth! There are many options for photo booths, from DIY to elaborate professional set-ups, in all kinds of sizes. What you’ll use depends on what kind of event you’re running and what your budget allows. How much room you have on location also influences the set-up you’ll choose. User-operated or with a photographer? Do you need WiFi-enabled, a printer included, social media sharing? This is one of the most important questions you’ll face, and the most decisive factor in it is likely budget. You can get professional set-ups that are quick and easy to establish at your event. This will save you a lot of time but it will likely also cut into your budget more. A DIY set-up can be a lot cheaper but you will have to invest the time to build it. Furthermore, they often also require some technical understanding and the willingness to do proper research and read up on the topic. These are the perfect choice for those with a decent budget who prefer a sleek- and professional-looking photo booth and don’t want to spend a lot of time figuring out the details. When you go for a professional set-up, you can often choose whether you want to buy or just rent a booth. If you organise a lot of events and are using photo booths regularly, buying one might be a good long-term investment. For one-offs, renting is a great option. 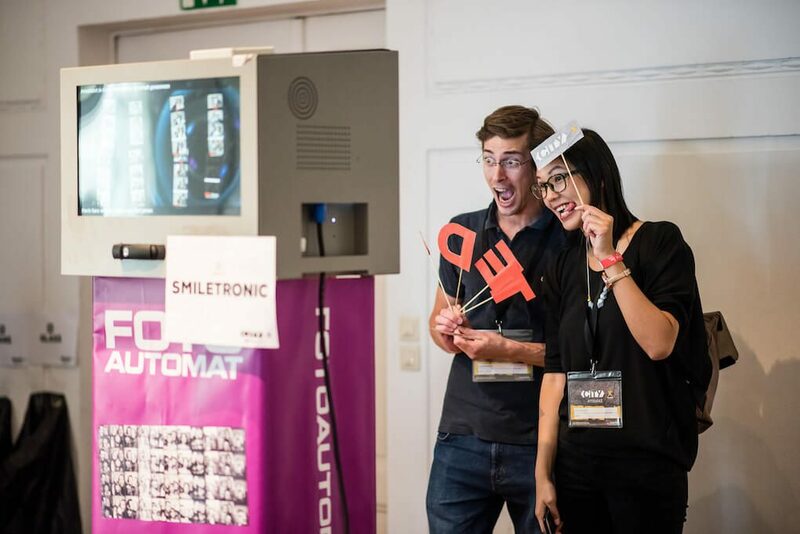 Creating your own photo booth is the perfect solution for tinkerers and those who don’t mind investing a bit of time. You’ll have to find the right combination of hardware and software, build the whole thing and then test your set-up extensively. It‘s also a great option if you already own most of the things needed, be it a DSLR or a computer with a good webcam. There are many types of photo booths, from traditional, closed booths to completely open-plan solutions, as well as something in between the two. Some options need a photographer, others are user-operated. Both open and closed solutions have their advantages. But for big events, open photo booths make a lot of sense. Open, kiosk-style photo booths are usually more inviting because people can see others having fun using them and are drawn to them as well. 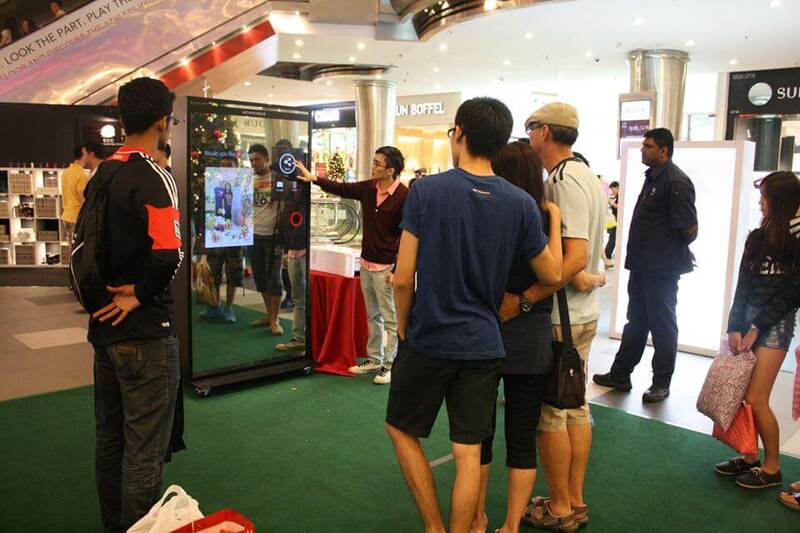 In most cases, you’ll want to go for an open kiosk to encourage engagement. Set up an event photo booth, encourage people to share the photos using your event’s hashtag and gather all the post from multiple social networks on a social wall. Once you’ve acquired the right photo booth, you can start setting everything up for your next event. Whether you have a pro booth or a DIY version, it’s always important that you test it extensively before each event. You’ll want to get really good at building your booth quickly so it doesn’t take up too much time on location and to ensure you won’t hit any snags (or can at least deal with any issues swiftly). So practice, practice, practice until you can put your photo booth together in your sleep. No event photo booth is complete without props. They make posing more fun and encourage attendees to be creative. It also takes away some of the fear some people have about posing for a photo because they’re sufficiently distracted by the props. You can make your own props, using wooden sticks, paper and a glue gun, or even buy some on Amazon. We recommend a good mix of general props — think hats, moustaches, hearts, etc. — and stuff that particularly fits your event. If you can come up with some props that really go with your industry, your event, your product, and so on, it’ll make the photo booth even more interesting and useful. And in that vein, definitely, create some signs with your hashtag! That way your hashtag will show up in the pics people share and will remind attendees to use the hashtag in their posts as well. You can make these yourself or, for example, look for something on Etsy. With your event photo booth and your props all set up, you now need to make it interesting to attendees. Place the photo booth at a location where many attendees will come across it, where it can draw attention and lure people in. If you hide it somewhere out of the way, only very few people will even realise it’s there. Attendees should naturally flock to it and have enough room to manoeuvre around it, wait for their turn and chat with each other. If you notice people are hovering near the booth but aren’t really making a go for it, just grab a few of your teammates and start using the booth. Once someone has made the first step, others usually feel much more confident about approaching. Set up signs pointing out the photo booth and promote it in your flyers, presentations, etc. together with your hashtag. Personally encourage people to use the booth. If you’re worried people won’t know how to use it, place a teammate there to help people out, explain how it works and motivate them. To get the full benefit of your event photo booth you’ll want all those pictures to end up on social media in posts with your hashtag. This is why it’s important to get a photo booth set-up that allows social sharing of some sort. Many photo booths can either share photos automatically to a Facebook page you specify, post them via your Twitter or Instagram account with your hashtag, or even publish them in a Flickr photo album. Some booths even allow people to log in to their own social accounts to share or to simply grab pics via a QR code with their phones so they can then share them. In any case, always encourage attendees to share their photos on social media and to use your hashtag when doing it. The easiest way to do this is to put up a few signs by the photo booth asking people to do exactly that. When you connect your photo booth to a social media wall, you can create a live-updating album of your event. Anyone can view the wall online and you can display the album live at the event, so attendees can have fun seeing their own pictures show up on the social wall. Style your social media wall the way you want it and brand it for your event. Display the wall — perhaps on a screen on stage and/or on displays around the venue. Use the title option in the Walls.io sharing settings to usher attendees towards your photo booth. … to include a call to action for your photo booth. They foster interaction among event attendees: photo booths are great icebreakers that get people talking and make an event more lively. They keep people entertained and happy: sometimes there are wait times at events or people just need to unwind for a bit, and a photo booth is a fun way to keep people occupied. They encourage sharing: A correctly set up photo booth will bring you more shares on social media with your hashtag, which will give your event better reach. They create a memorable experience: you want attendees to fondly remember your event, and a photo booth contributes to the happy memories. Even if your next event is still a while away, take the time now to figure out how you can incorporate a photo booth and research which of the many options will be ideal for you. 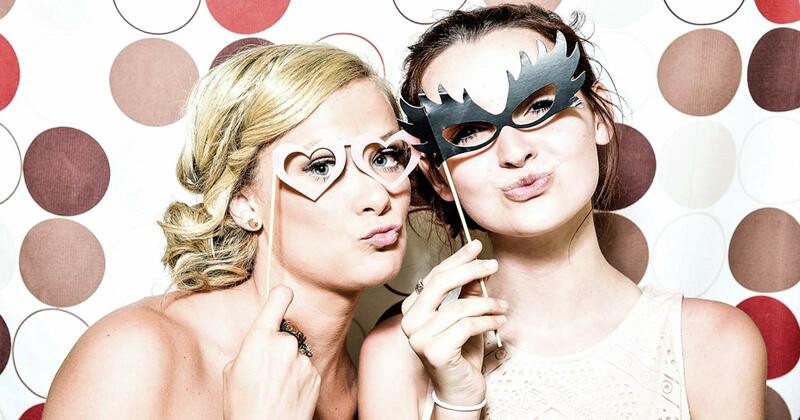 You’ll love having a photo booth at your events! After all, a picture says more than a thousand words.